Yes, sometimes you just feel like there is more love to give. Here, love means yarns. When you know deep within you that the yarn you are holding for the longest time would feel more used and more loved with other people, you just have to share them, lest, you end up with more stash you can handle. Do not misunderstand me, i do not want to let go of all of my yarns. Sometimes, you just know when it’s not about letting go, but sharing. When blessing just comes your way, share them. So there are more to receive. Last Sunday, the priest told us, Love begets love. sure it is. When you give love, sooner or later you end up getting some, and sometimes more from what you have given. This yarn was among my last purchase from Dreasmshoppe, around three to four years ago. I tried several times to make a project out of this, but failed. Call me anything, I love making wearables and these type of yarns just don’t suit my need. I got attracted on buying this, hence it’s been sitting on my stash for the longest time. 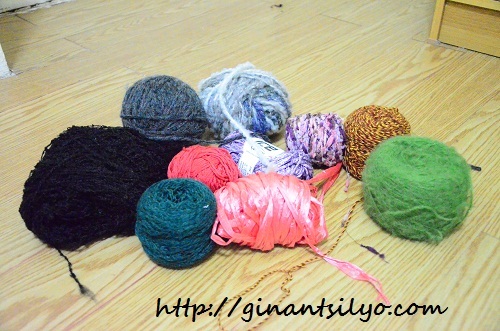 This yarn costs around Php200 a ball. I think it’s a wool blend something.. hehehe, forgive me for not remembering. The color is variegated blue to dark gray and light gray. 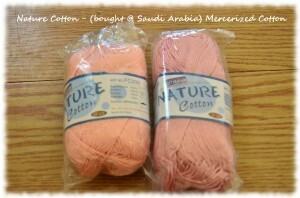 This is one of my last purchase of yarns from www.craftandme.com. I have used the yarn as accent to a bolero I made for a friend. 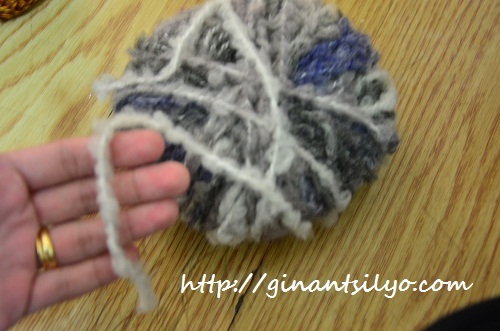 This is not easy to use since it’s a bubble type yarn. But the color is very pretty. 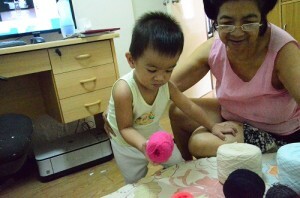 I think, this yarn belongs to one of my earliest purchases of yarns from Baguio. I have incorporated this yarn in a number of projects, still the yarns resist to disappear. I think the original ball was very big, because I have made two shrugs from this (from what I remember). I have made so much use of this yarn already, it is time to serve another master. The color is orange, red and maroon in one ply. 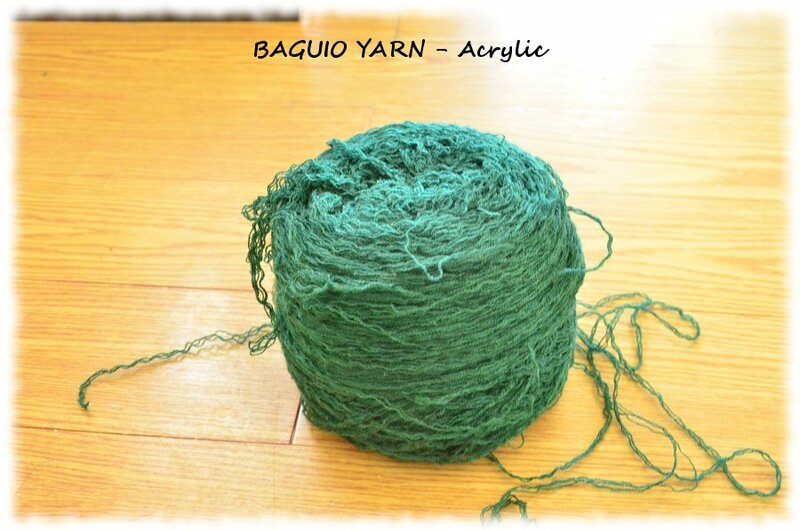 as compared to other acrylic yarns from Baguio, this one is not loosely plied so it is really nice to use in any project. 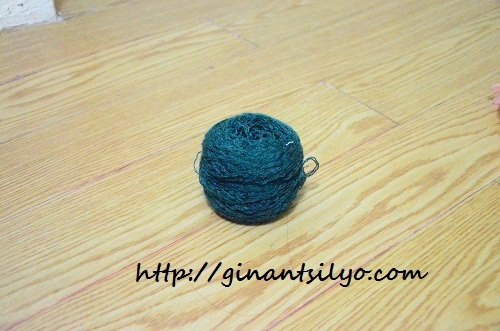 This yarn belongs to the lot I purchased along with the bubble yarn. I was so interested on different yarn types, so I included this on my purchase. It’s very thin but when crocheted, it gives anything a fuller look. so do not be mistaken in achieving a very lightweight project. I have a friend who sold me a lot of yarns she purchased somewhere. 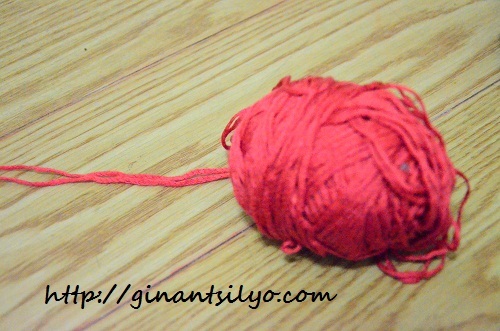 This big ball of yarn is one of them.. It’s so big and thick and I got like so many balls of them. so many that i gave one big ball to my friend who owns a cat. because cats love yarns. and it’s so woolen like those balls of yarns that is being played with cats. I think the cat would love it. and he sure did. I even made the cat a blanket so he would feel more loved. So there they are. I hope the recipient would love them as much as I did, or more. After finding more about the identity of my recipient, I feel a bit proud that she dropped by my site to say hello, more that she was able to chat with me for some time to chat and share. I found out she is an artist who needs different materials for her upcoming project, and that due to time constraint, she is unable to wait for incoming yarns she would receive come may. I got curious about her identity that, when I googled her name and saw her works, I was amazed and awed. I knew it was asking too much to go through the yarns I could give away, (not to mention i still promised someone more yarns from my stash). My question is what can i give? That would not really hurt me much? You see, when you are attached to the yarns you have kept for so long, you feel a connection, so that is why when i give a piece from my stash, i try to share the story of that item before letting go, so i could still remember. 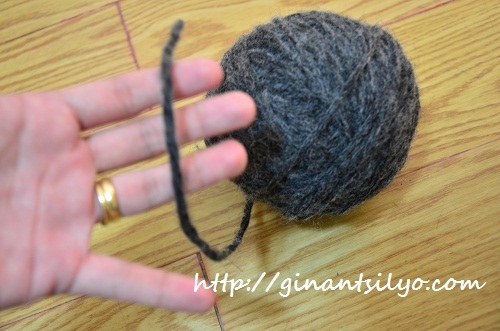 This is an experiment from “recycling yarns”. I managed to obtain a very good looking knitted top from a thrift shop. 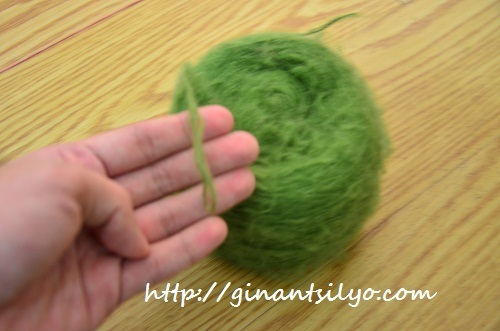 The yarn is a ribbon type, silky and soft. How I never managed to create something from this, I wonder. I guess, it’s because, “recycling” was never for impatient people like me. I think I threw away the knitted top I can never manage to defrog properly. 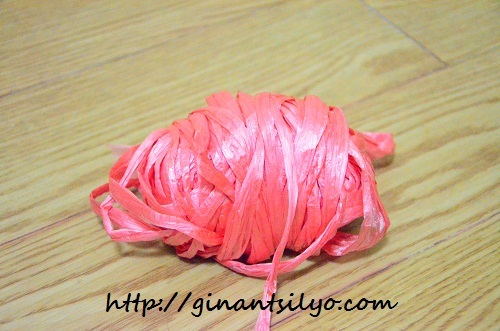 This plastic raffia, is another purchase from Indonesia. It is a left over for my attempt to crochet a bag. Unsuccessful though. It is not easy crocheting with plastic and more, you can never rewind this yarn into a ball again, because it’s too slippery, but I think, “she” mentioned that she likes this, so here it is. Yes, i think I have given two of this last time, and I am giving another one. I figured, I would never purchase another ribbon yarn again because I would find it hard to form it into lacy kind of clothing. I knew my husband won’t be happy seeing half of this lot going to other people i do not even know. But I was thinking like, they like it this much, maybe, in some way it can have more use than what i was planning for them? True enough, I do not feel so much affinity with this yarn because they have been purchased just recently. This yarn is a forgotten yarn. I was trying to rummage at old boxes to see if i would still have the soft fluffy yarn she was eyeing for but couldn’t find any, and then I saw this big leftover (from what my friend gina, made a beret) boucle yarn from Rosario, Pasig. And I was amazed. 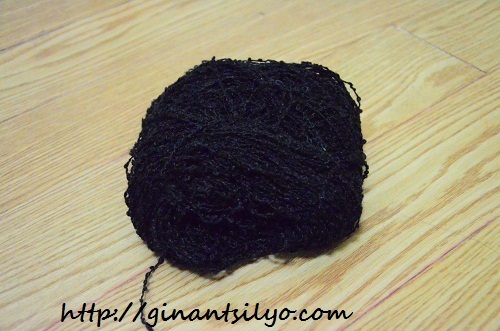 this yarn was waiting to be discovered so it could get a new master! 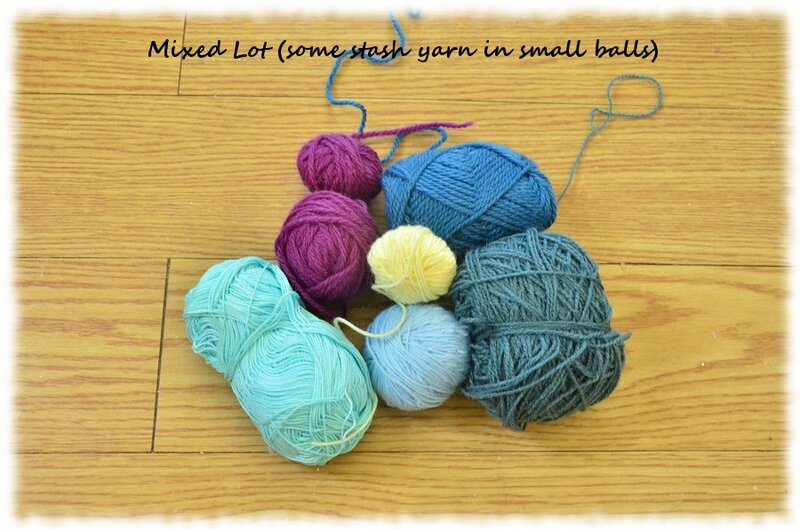 I thought I have given all of these yarns from the last year’s giveaway, but again I discovered that I still have one more small ball left to give. 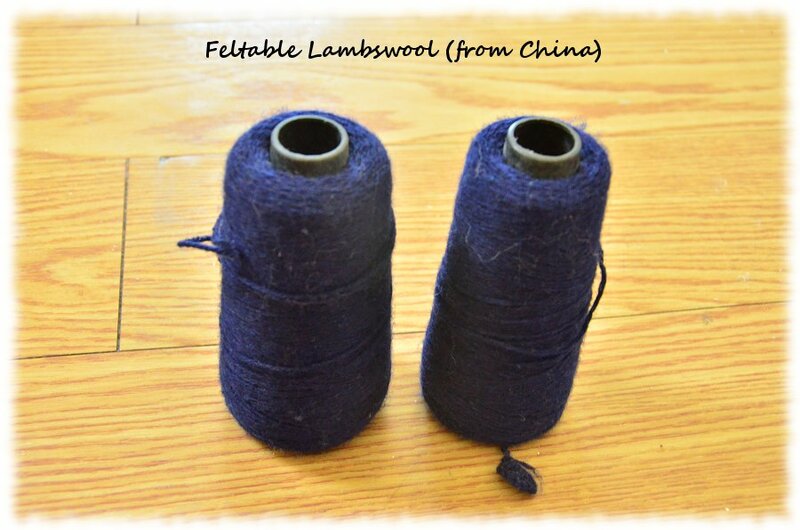 This entry was posted in Blog, Yarn and tagged yarns on February 11, 2013 by Lorelie Dazo. After my first yarn frenzy at https://facebook.com/onlineyarnstore, I told myself I would not do it again, but I am really curious about the other yarns. One time, while browsing her page, I saw a post that tells she would be posting new yars for sale!!!! And yes, I did wait for the yarns to come, until I was overcome by sleepiness. When I woke up, the novelty cottons and basic cotton I was expecting to get are already taken but these bulky acrylic still had loads of left overs. 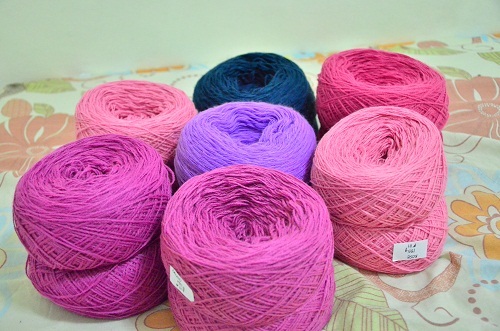 Disappointment plus excitement lead me to a whopping P1,900 worth of Yarn Purchase. I immediately concluded – YARN HOARDING. Not Good, when you have just woken up. The problems of facebook online buyers and the frenzy over getting the items first (without having the chance to browse first then decide later) leads to not able to afford what you bought, or more of you did not expect you have bought that much! With no shopping cart to indicate your shopping expense progress and no (remove this item) from your list because you respect their regulations of “touch move”, I ended up not knowing what I actually purchased, if I have hoarded too many of the same colors or if you are still within reasonable amount of spending. Good thing two friends came to the rescue. Gina, who willingly bought part of my stash (I told her to get anything she likes so long as my bill will go down) and Ian, who is too willing to buy yarns for me as birthday gift (which was last year, mind you). Hence, I ended up not paying anything. The last part of my stash would be paid by the seller, herself as our agreement for the images I will be doing for her. And though I immediately regretted my action during that morning, I am super duper happy for the yarns that have arrived on my doorstep today! Yippee!!! Thanks to my friend, Ian.. I promise to make a bonnet for him 😀 hehe.. but look at the colors I’ve gotten?! Would he like a fuschia bonnet? hehehe.. 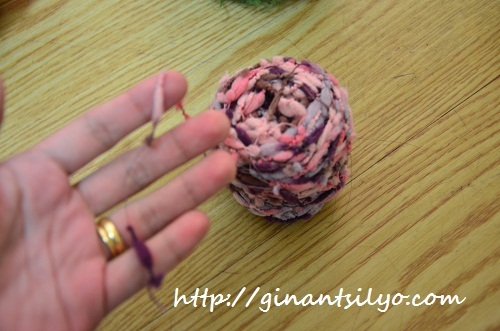 This entry was posted in Blog, My Story, My Life, Yarn and tagged hoarding, ian, pink, violet, Yarn Source Manila, yarns on January 21, 2013 by Lorelie Dazo. I am closing a deal with the owner of Yarn Source Manila as an image provider and would be designer of her multiply page, if (I managed to learn how to do it). Here’s my peg – will work for yarn. 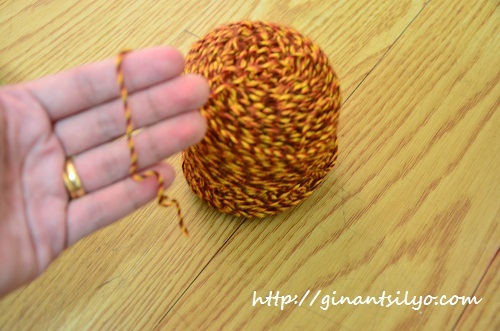 Psychedelic Shell using Baguio Cotton Yarns – Free Pattern Available Here! It was a good opportunity that the owner launched a photo contest which I joined and she later contacted me to outsource some images she would use to promote/enhance her multiply and facebook page. 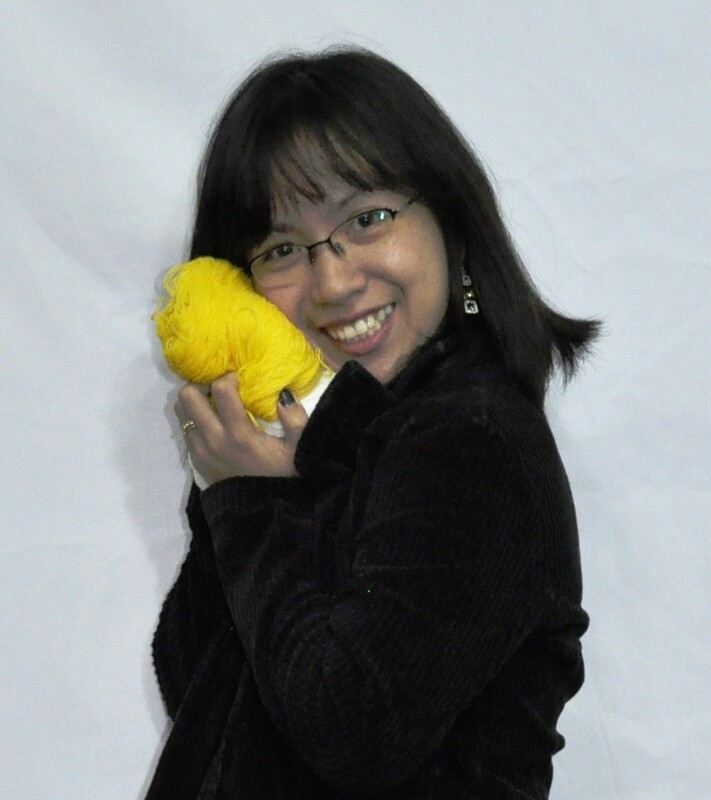 This entry was posted in My Story, My Life and tagged banners, image, Yarn Source Manila, yarns on January 20, 2013 by Lorelie Dazo. Hooray for friends I’ll make, oh hey…hey! Will he choose the black one? 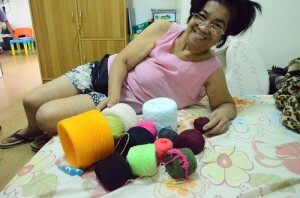 This entry was posted in Blog, My Story, My Life, Yarn and tagged happiness, images, Yarn Source Manila, yarns on January 16, 2013 by Lorelie Dazo. Yarns take up space. In my case, it’s worth one whole room. I recently made some sinful purchases despite the pledge to lessen them. My excuse? I am now going to sell and I need materials. Pardon me for being this eager beaver, but since I am focusing on bags, I just have to have these wonderful bag handles! and so I told myself, I have to make sure I can sell something! 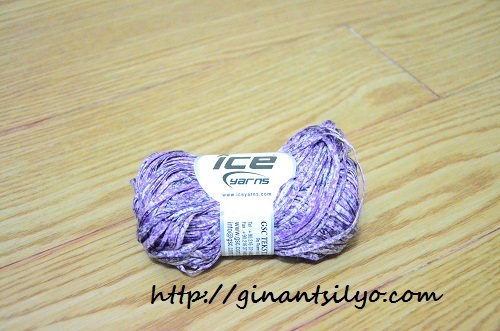 But before I can make something, I have to have the yarns to use. And I made a recent discovery. 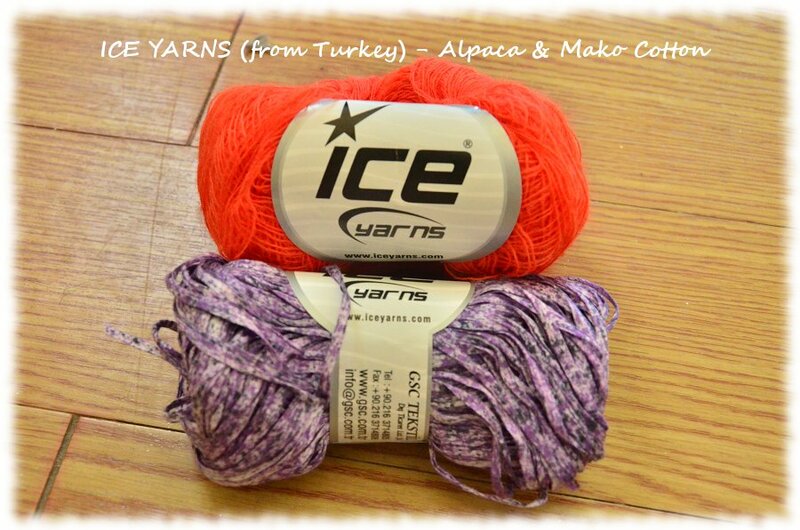 These yarns are awesome for bags. They are strong and durable. Though crocheting them is very painful for my hands, but I love them!!!! I have to repeat my bag hack because I ran out of yarn. And then this other bag, which I designed myself ( I do love the design, mind you) is almost done! but I cannot move a finger to finish this. I’m sick of doing dc’s!!! hehehe.. But the body is made from wool, which makes the whole thing quite expensive. Anyway, back to the room. I have to tidy this one more time, which will lead me to another purchase – a decent shelf. This entry was posted in My Story, My Life, Yarn and tagged bag, bag handles, for sale, yarns on January 13, 2013 by Lorelie Dazo. I got a reply from her telling me she really liked the image I made. This actually brightened my day (and the days ahead). 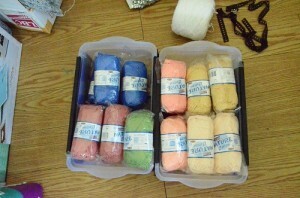 Yipee for Yarn Source Manila! Soft to touch and thin, just the way I like it. I just hope the next time the items i want to buy won’t be sold out. Happy crocheting everyone! 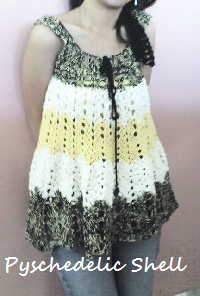 This entry was posted in Blog, Yarn and tagged crochet blouse, Yarn Source Manila, yarns on January 11, 2013 by Lorelie Dazo. 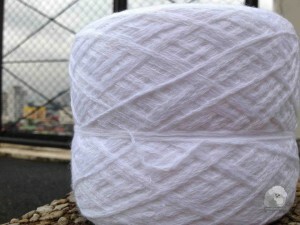 YarnSourceManila is giving away bagful of yarns for new year! Whoa! 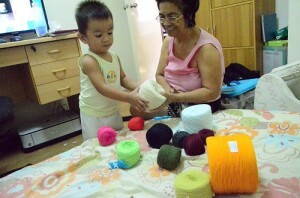 I heard that our local yarn (online) store – YarnSourceManila, set up a contest on her facebook page. Now, let’s welcome 2013 with a photo contest! I will give a bagful of assorted yarns to the winner. 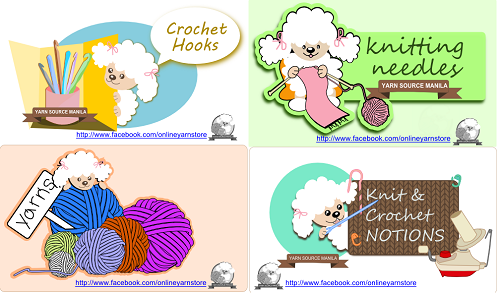 just post your entry on the timeline or wall of this fanpage – facebook.com/onlineyarnstore. Remember – the theme is the NEW YEAR. 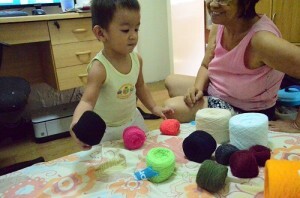 Just make sure that YARN SOURCE MANILA will be placed somewhere in the photo. The winning photo will be used as a cover photo for this facebook fanpage. Deadline of entries is January 1st, winner will be announced on January second Happy new year everyone! Let us all join guys! I do hope I will win the contest. Hooray for Filipinos for sharing their love and passion! 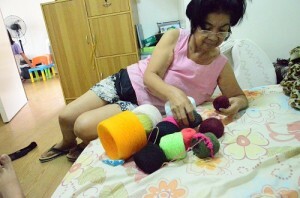 This entry was posted in Blog, My Story, My Life, Yarn and tagged contest, images, Yarn Source Manila, yarns on December 30, 2012 by Lorelie Dazo. Who won the give yarns this christmas part two contest? You might have not heard from me who won the “Give Yarns this Christmas, Part II” Contest, so I will update you guys. Let’s hear first what our dudettes made for christmas. 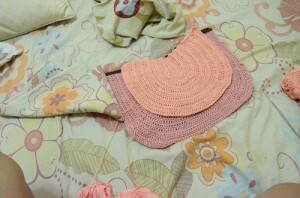 One entry came from a dear friend, Gina – who crocheted purses, bags and headbands for her friends. Lucky them! This year since I’m busy too much I decided to crochet gift items but sadly I cannot crochet as much as I want so my gift is limited to those who are near my area and to those who I see everyday. Whoa… to the people who will receive these gifts, you are very lucky for having the opportunity to be in her Christmas list. 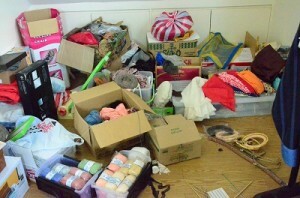 Devoting your time to crafting and giving is not easy especially for a full-time employee/mother like Gina! My most favorite from the treats is the green mesh bag on the right side. My favorite color is green so I am actually biased. I requested her to take a closer pic of the bag though before she gave it away. Hopefully she would update me for a nicer photo. I just crochet these from October to this day and here it is, I had to share. 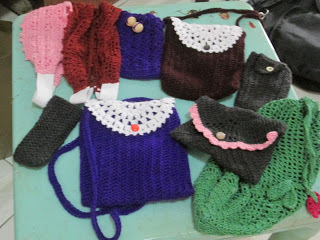 I know it’s cold where they are specially now as its winter season so I made some wearable long sleeves, shawl , scarf and hat to keep them warm, pouches and bag for their accessories. To these gals, thank you for joining and sharing your gifts! I salute you for actually taking the effort to handcraft your gifts. Watch out for new contests next year! Have a happy and fantastic new year everyone! 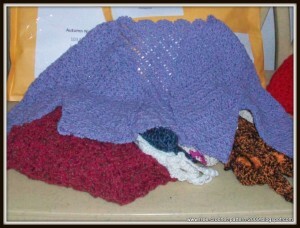 This entry was posted in Blog, Yarn and tagged contest, gina, girlie, yarns on December 30, 2012 by Lorelie Dazo. Few years back, I have known a lot of people through my craft that had graciously encouraged me to continue crocheting by sending me yarns even they are from overseas. Almost all my friends who have been outside the country would come home or would send a parcel for me with yarns of different colors and fiber content. Even though yarn stores were really out of their way, they were willing to be lost just so they could buy me a ball or two. And even some of my friends here in the Philippines, would go to Baguio for my sake. I also met some few through my blog that unhesitatingly befriended me and sent me yarns as token of friendship though I have never met them in person. These are the reasons why I, myself, am not hesitant to send a lot of yarns too, so that the feeling of excitement and gratitude would proliferate and would cause a continuous chain reaction, that they too would find in their hearts that it is really heartwarming to reach out and share. With this, I would like to thank Gina, Cherry and Girlie, for giving me an opportunity to share what I have experienced and extend my gratitude to those people who have shown me kindness in the same way. May the yarns I have sent on your doorsteps have made your Christmas, a little bit happier than it already is. To all of you, Merry Christmas!!!! This entry was posted in My Story, My Life and tagged cherry, gina, girlie, yarns on December 21, 2012 by Lorelie Dazo. I am going to give away another bag of yarns for free! 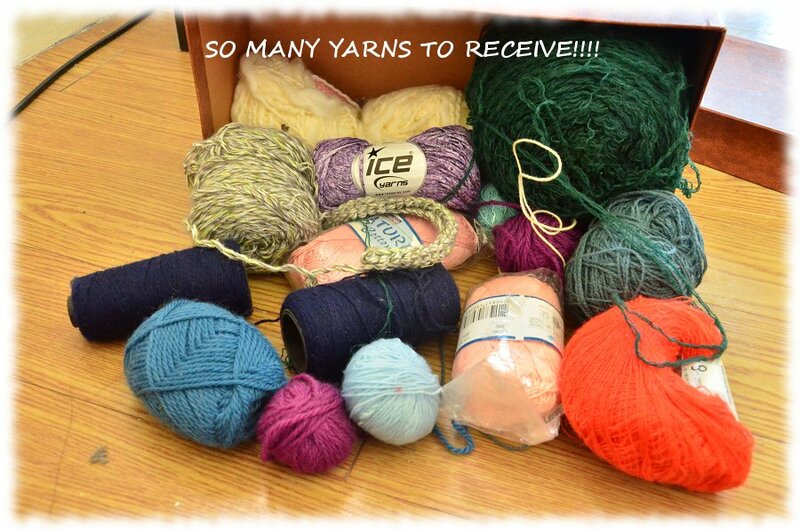 So many yarns to receive!!! 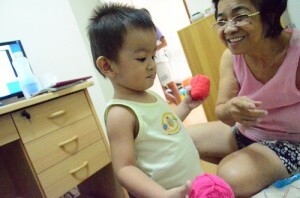 Create a blog entry about making crocheted items as christmas gift. I will announce the winner (or winners!) before December 15, 2012. Deadline of entries will be on December 7, 2012. I will announce the winner (or winners!) before December 20, 2012. Deadline of entries will be on December 18, 2012. Hope you will join and have colors of ginantsilyo! >> You should be able to tell a story about the item you are making and to whom you will be giving it away and why. >> The post should contain pictures of the finished item and if you can tell how you made it/pattern, the better. 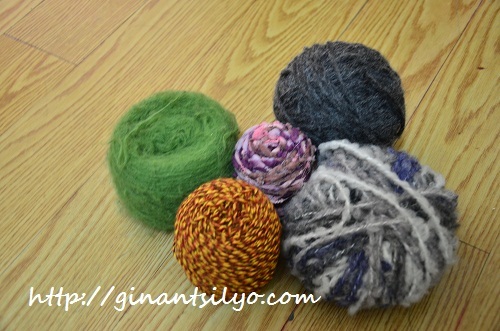 These are the yarns you will receive from me! 1. 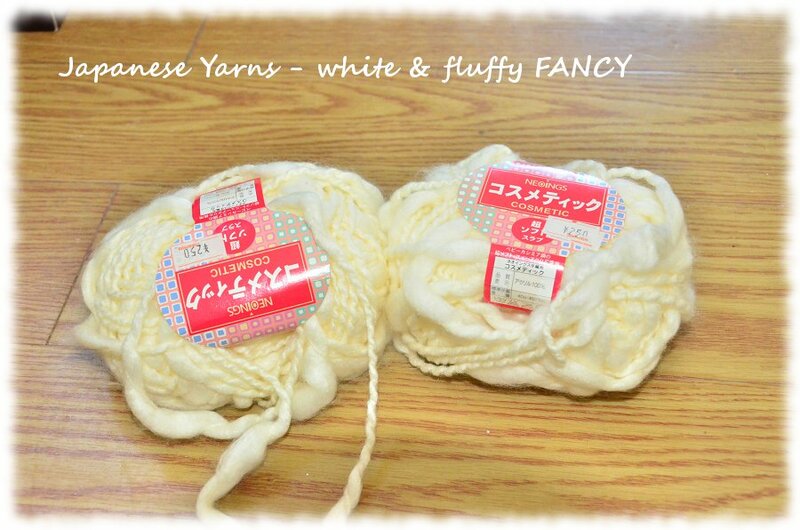 Japanese Fancy Yarns – they are soft and fluffy. I have last lot of two balls. I previously made slippers from these yarns and they are terribly comfy! Great for gift giving! 2. 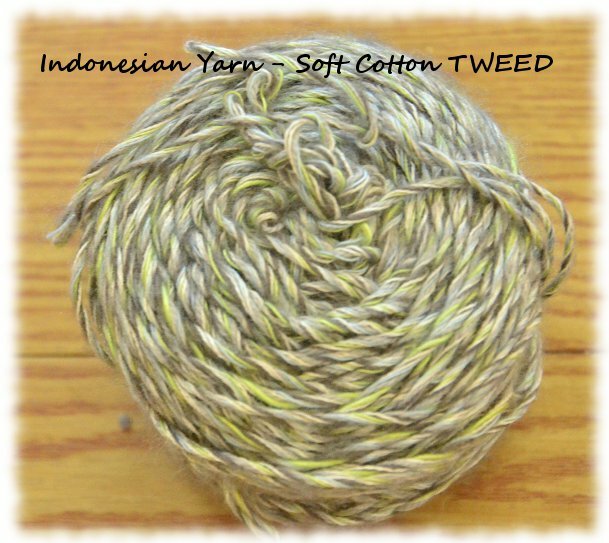 Indonesian Yarn from www.crochetandme.com. I had difficulty choosing which to part. Since I have three balls of these (Oh no, please do not beg me to give them all!) and its my favorite shade! I just have to let go of one just for christmas! 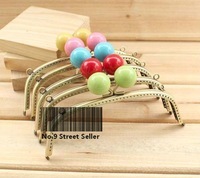 One ball is enough to be a small bolero or a bag. 6. Lots of yarns. I have lots of these loads. These are acrylic except for the mint green which is cotton. I will never use them probably, but you might want them. This is just bonus, you can tell me to keep it if you do not want them. 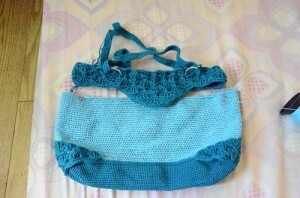 This entry was posted in Yarn and tagged contest, free yarn, yarns on November 20, 2012 by Lorelie Dazo.